Charles Bertie Mains (died 1952, aged 84) – Temple Lodge, No.33, Duncan, B.C. Charles Bertie Mains (died 1952, aged 84) joined Temple Lodge, No.33 circa 1918. (We will go through our records in the near future and get the exact date he joined the Lodge.) He demitted in 1933. Charles Mains ran a butcher shop in downtown Duncan for many years, circa 1911 to 1951. The building he built for his meat business in 1922 is still standing at 70 Government Street. It is now occupied by Jim’s Pools and Spas. 70 Government Street was designed in 1922 by architect Douglas James, who also designed 45 Craig Street (half a block from 70 Government Street) in 1922 for Temple Lodge, No.33 member Harold Fairfax Prevost. Charles B. Mains ran his meat business from 70 Government Street until his retirement in 1951, aged 84. After his retirement, 70 Government Street became the business premises of a company started by another Temple Lodge, No.33 member, Herbert W. Dickie, which used it as the office for their insurance and real estate firm. Herbert W. Dickie died in 1949 but his business, H.W. 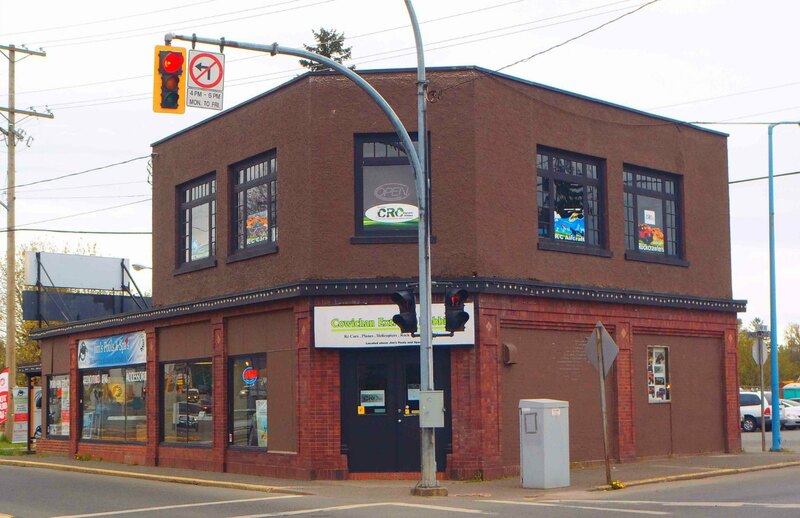 Dickie Ltd., operated in Duncan until 1999, when it was purchased by Coast Capital Credit Union, now Island Savings. Mains – The death of a pioneer Duncan butcher, Mr. Charlie Bertie Mains, aged 84, occurred in Duncan Hospital on Sunday. He had lived in Duncan since 1911, coming to V.I. [note: Vancouver Island] in 1899 from California. He had resided previously in Victoria, Ladysmith and Duncan. His shop on Government Street was for many years one of the best known meat stores in the Cowichan area, until advancing years had of late caused him to slacken pace and, finally, to sell his holdings. He had continued to live in his home opposite his shop [note: Charles Mains home is no longer extant]. His birthplace was Tennington Point, Illinois. Mr. Mains was interested in affairs of the district, although a short term as school trustee formed his principal entry into public life. His wife, Rose, predeceased him last year. Surviving him are three daughters, the Misses Hazel, Florence and Olive Mains, all of Duncan. The funeral took place from Hirst Funeral Chapel on Tuesday afternoon, with interment in the family plot, Mountain View Cemetery, Somenos. “Sun of My Soul” was the hymn sung. The Rev. F.H. Golightly officiated. Charles B. Mains is interred in Mountain View Cemetery, North Cowichan. We will get a photo of his grave in the near future.